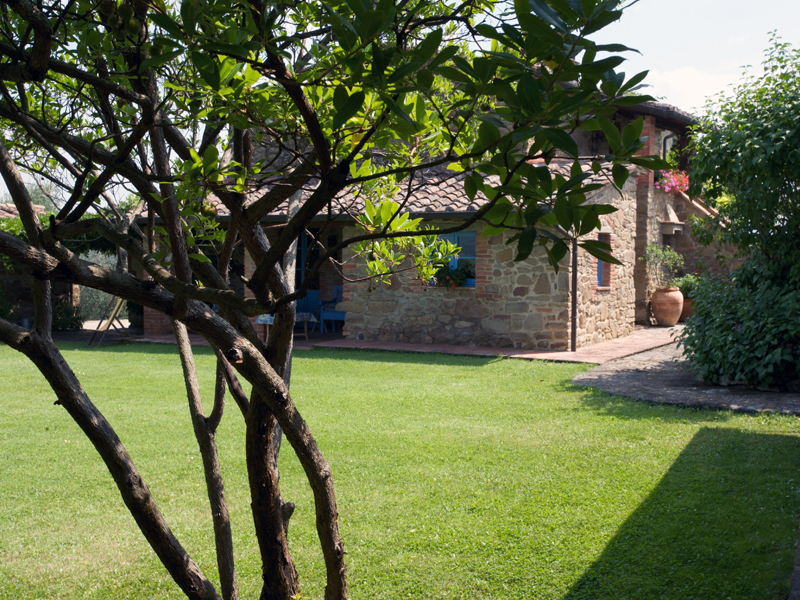 Join Niki Saccareccia, E-500 Yoga teacher, for an inspiring retreat at a gorgeous, organic eco-farm in the countryside of Tuscany. The romantic landscapes, rich culture and charm of Italy have been calling, and we’ve answered. Get ready for a magical experience generously filled with nourishing yoga, delicious food from the organic farm, replenishing time in nature, rejuvenating time to pamper the body and spirit, and plenty to explore with your fellow seekers and travelers. Our spiritual ancestors took retreat in order to experience higher consciousness, to remove all distractions and tune in to the deep wisdom source within. We’ll retreat for a 5 night, 6-day immersion in mindful living to remember and activate our Inner Healer – the ancient intelligence that is always working in our favor, for our health, for our happiness, and for our joy! Single Room // $3,050 per person // Single rooms have one queen bed. Double Room // $2,550 per person // Double Villas have one queen bed and one single bed. Message Us with ANY Questions About Anything! You can fly into Rome Fiumicino – Leonardo da Vinci International Airport (FCO) or Florence Airport (FLR) and we will help you organize transfer, or you can rent a car and drive to the beautiful retreat center. I definitely got more from this retreat than I anticipated in many ways. I never expected to connect with people so quickly and feel comfortable being so open. It was refreshing to be in a judge free, supportive zone with varieties of people with the same focus. I like the mix of yoga/mediation with excursions and free time. Exactly what I was looking for. It incorporated a vacation with self care and purpose. I didn’t want to be trapped in a beautiful place doing yoga 6 hours/day etc. This was a great mix of time of events. Walked away with anew faith in my fellow man, a respect of others and their cultures and a reminder, people are genuinely good and supportive. Ignore the “white noise” and connect. This retreat is curated for anyone who recognizes that their life is too noisy and is feeling a call towards the deep realigning that simplicity offers the human spirit. Uncomplicated, salt-of-the-Earth days allow us to fully indulge the senses, nourish the heart and calm the mind.Farm fresh organic food, rolling green landscapes, fresh air and nights spent under the cloak of starlight will bring us back to our natural rhythms. 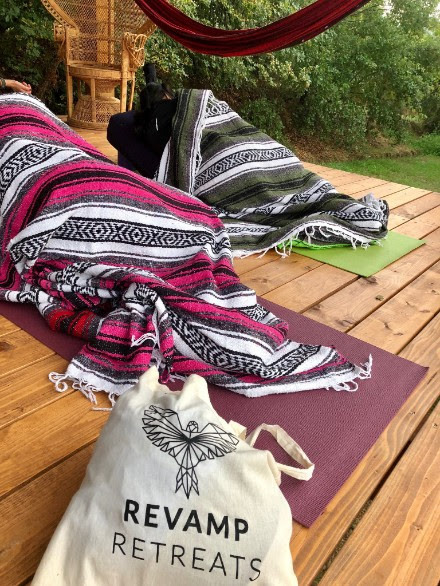 Give yourself the opportunity to make a ritual of self-care and a habit of having fun in an incredible, family-style villa walking distance to organic farmland and a short drive to a natural cliffside hot spring.With yoga’s guidance and daily practices, we can reconnect to the deep calm that soothes the spirit and allows that childlike joy to express itself! Spend time exploring new terrain and ancient cities, take a bike ride through the countryside, swim in the infinity pool and enjoy the company of new friends in a foreign land. Taking a break from micromanaging our adulthood means we can settle into that first-night-of-summer-camp excitement and the pulse of curiosity and wonder. Taking retreat is built in to our biology; usually, in times of deep work like childbirth, death or sickness. But in our modern age, these milestone moments are so much more subtle. We take an afternoon to retreat from social media. If we have the discipline, we take retreat from the never-ending demands of our work emails between the hours of 7pm and 7am. Some of this retreat ritual is built into our culture: we take a short vacation away from our hometown to enjoy a change of scenery. More subtle than this, we take respite from our partner or children with a day or night out with friends. In all of these ways, the little retreats we take give us a brief pause to reboot from surviving the low-grade overstimulation that has become our social norm. In a time where technology has never been more available, finding the space to truly unplug couldn’t be more necessary to our biology and even more to our spiritual survival. To “retreat” is a cornerstone of spiritual life because it is required for us to thrive. Daily practices like yoga, meditation, self-love and compassion, help us to navigate and survive the inevitable highs and lows of being human. These practices support the journey through day-to-day moments. The moments that shape our attitude, our ability to adapt and change, our karmic debt are the same moments that can reinforce all the ways we get stuck and dig ourselves into a rut. True retreat – stepping away from the day-to-day, leaving home for foreign terrain, leaving the comforts of our social and professional networks for the company of strangers, experiencing new practices, foods, sounds and conversation, taking literal space to get a different vantage point on our life – this is where the revival of spirit takes place. This is where spiritual thriving takes root in the garden of consciousness, without the white noise of our normal responsibilities and expectations. And here’s the thing: the garden is constantly being seeded. When you’re aware of it, intentional living, deliberate action, conscious relationship can flourish. But more often then not, the daily grind gets the better of your best intentions and you end up using yoga classes, meditation apps, and the like to escape from the grind in a subtle plea for true retreat. The small moments that should just roll off of your back start to add up, the tension in your shoulders becomes the new normal and eventually you reach a point of self-preservation shut down. Then you fall into the good old habit of distraction, using whatever vice has never let you down. You lose your way…even just a little bit. It’s the same cycle for just about everyone, because we’re human, and we’re flawed and being on top of our game takes work. So whether we are really tending the metaphorical garden or letting it roam wild and unkempt, something is growing and something else will flower from the things we do and the thoughts we entertain. So here’s the other thing: Thriving is seldom born from the seed of luck. We have to plant that ourselves. We have to take care of our one, short life! 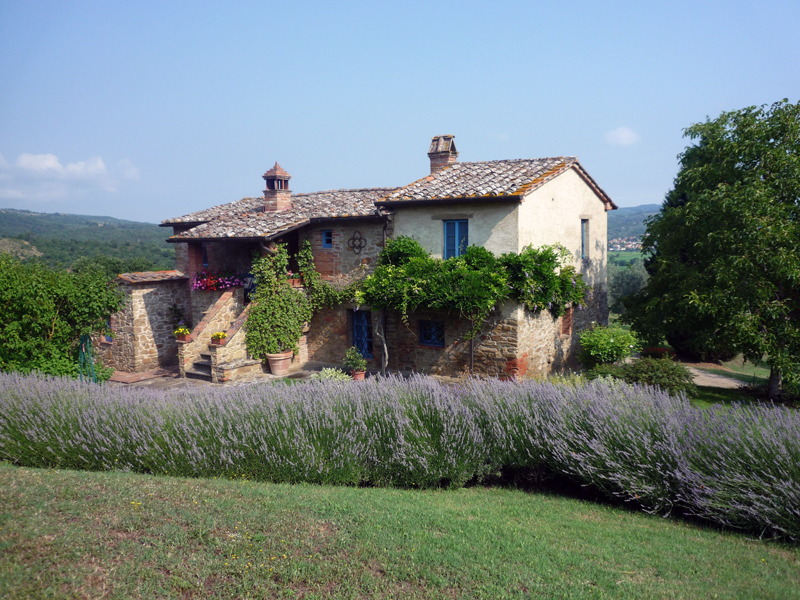 This August, we’ll leave the familiarity of our life to take a true retreat into the simple, family-style scenery of rustic Tuscany, Italy….on a literal farm…with seeds that were planted by hand. We’ll cook real food. We’ll pick olives and sip Chianti wine. We’ll hike in the countryside to natural thermal baths and soak our bones. We’ll explore ancient cities with new friends and do our daily practices of yoga and meditation. We’ll have the time to indulge in the deeper work of sound healing, self-examination and massage. Revival isn’t something we need everyday. It is the pause that’s just long enough to really get us breathing deeper and more freely so that we can reenter our life with more gusto, more enthusiasm and more inspiration. Can you imagine what seed it will plant for the next year of your beautiful and wild life? 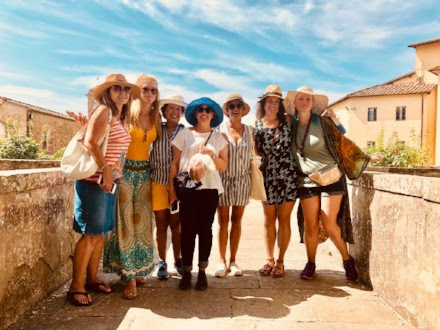 Take a look at some of the marvelous moments we spent together on our retreat to Tuscany, planting seeds of total happiness! Yoga, at its core, is the science of conscious relationship – how we relate to our aging body, how we relate to others, how we relate to the flux of our emotional self, how we relate to different yoga postures…what struck me the most while on retreat is how our relationship to the practices of yoga were probably the most constant thing. The country was different, the food was different, the air, the bed, the people, the sounds, the daily routine, the yoga room…all of it was unfamiliar and new and unknown. Granted, some people came with their spouse or friend, but even among our cohort, there was a strangeness to it all. Our morning and evening practices were the times to steep in the known and understood. And THIS is what made the unfamiliar parts so nourishing. Our practice is meant to be our homecoming, so that the other moments of our day can feed us as teachers, lessons and gifts. On my end of things, I was scheduled to arrive a day and a half ahead of the earliest arriving guest. But, on my connecting flight out of North Carolina en route to Rome, the plane had a non-emergency safety issue and 3 hours into a 9 hour flight, we did a 35,000 foot U-turn back to NC. My 20 hour commute turned into a 49 hour “gift” from the universe to practice breathwork while everyone around me became extremely unnerved, to practice standing in Mountain Pose for 4 hours while waiting in line to be re-ticketed, to practice asking my colleague for assistance when I was about to lose my composure, to practice self-acceptance when I DID lose it, and to practice humility in the face of all the factors that were beyond my control and best-laid preparation. The 60 or 75 minutes we get in the retreat of a yoga class is what prepares us for all of the time spent off of it, plugged into the events of our daily life. We don’t need to go to a spectacular countryside villa to connect to our best-self…but if you ever get the opportunity to, I’d totally recommend it! We had 2 dedicated chefs onsite. 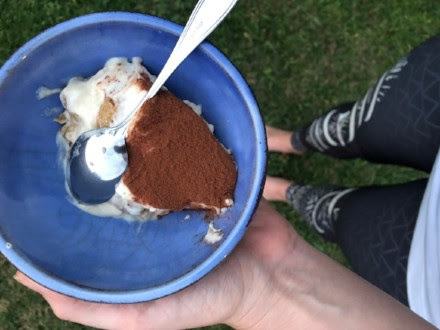 Erica spent one afternoon at her mother’s house preparing the BEST tiramisu I have ever had. 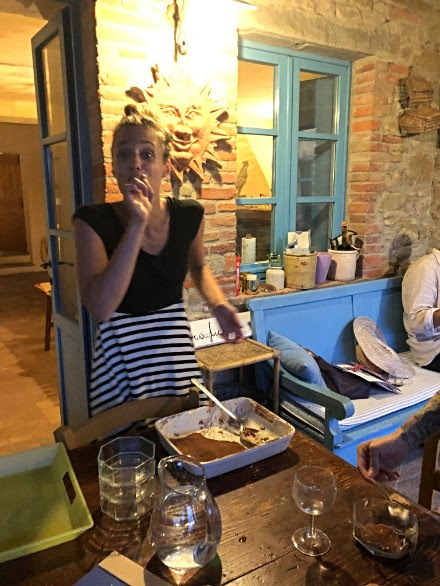 This is Francesca – our other dedicated chef – licking her fingers after eating her share of the tiramisu. It was seriously the BEST. Thank you to Onzie, Purlisse and Jao Brand for sponsoring my retreat! Your personal care and low-impact mindset is why we choose products like yours over all of the competition!